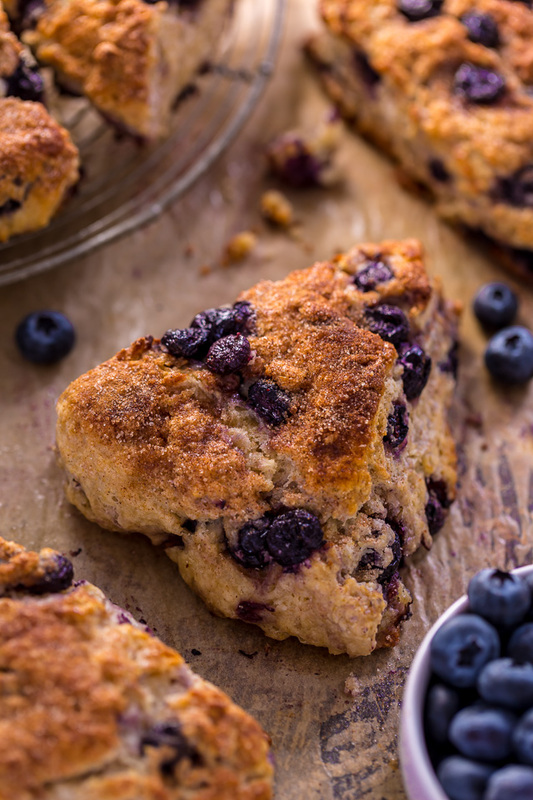 Mmm… these Blueberry Snickerdoodle Scones are so flavorful and perfect for brunch! Yes, that’s right; I’m sharing a snickerdoodle themed recipe in MAY! And I’m not even sorry. 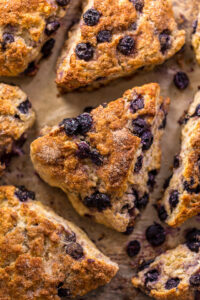 Because these Blueberry Snickerdoodle Scones are insanely flavorful and bursting with juicy berries in every bite. I’m so smitten with these scones I’ve actually made them 6 times this month. Yep: SIX! But don’t worry – I’m not eating them all! I’m actually hiring right now (eek!) so I’ve been making these blueberry beauties and serving them with coffee and tea during my interviews. Obviously serving cookies and cake, too. 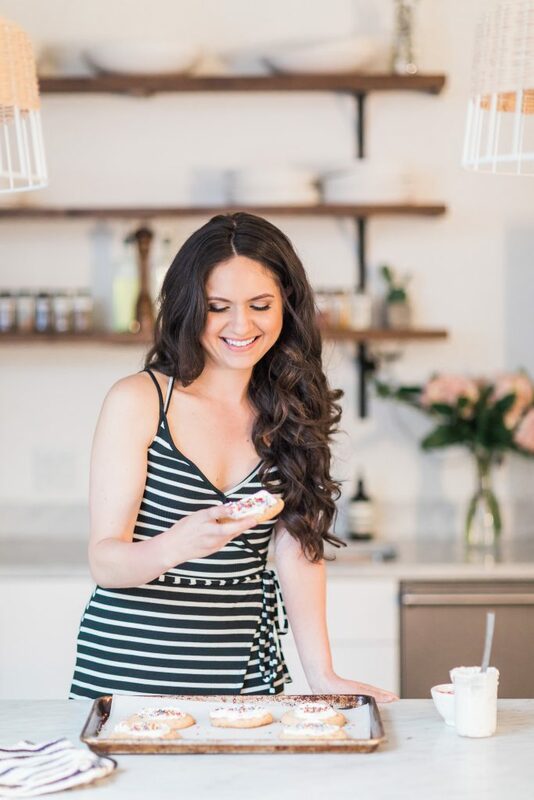 Because what kind of baking blogger would I be if I didn’t?! Dessert is – and always will be – the heart and soul of this business. And I’m really excited to have a few talented folks jump on and join the team! But I’ll share more on all of that later 😉 And that’s a promise! For now, let’s jump back into that scone life! You ready? The most important rule in the scone baking game? COLD BUTTER! I go as far as to suggest you pop your stick of butter in the freezer for a few minutes before you cut it up. ← Dead serious, my friend! Cold butter = flaky scones. Which is what we want, of course! Fresh or frozen blueberries may be used! But if I’m being completely honest, I do prefer fresh. If using frozen, do not thaw them before adding them to the dough. 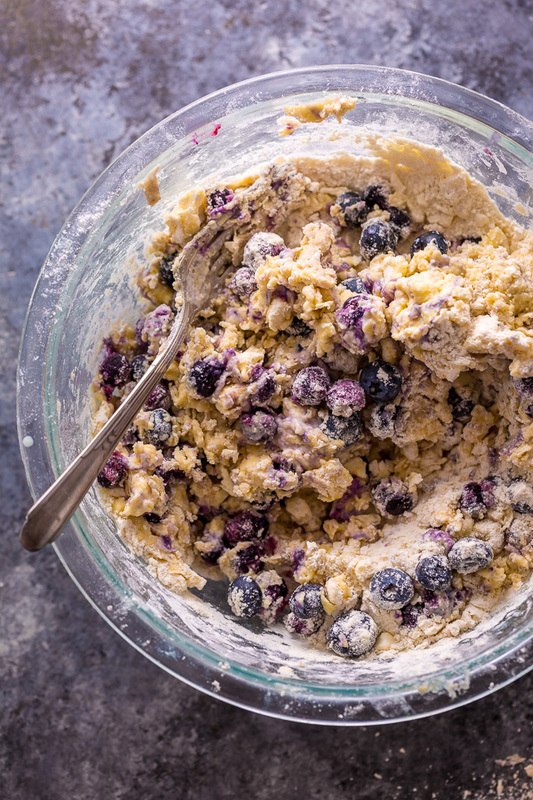 And don’t worry if the berries get a little mashed up when you’re mixing the dough. This is totally normal! Although it may be tempting, resist using more berries than called for, as it will lead to soggy scones. You can always serve them with extra berries on the side! When you dump the scone mixture out onto your work surface it’s going to be a shaggy mess. But don’t worry – just a few easy kneads and you’ll have a manageable dough at your fingertips. And if it’s unbearably dry after 6 or 7 kneads, you can always add a little more liquid (in this case, cream) a teaspoon at a time until it’s manageable. Because these scones are so flavorful, I didn’t add a glaze. But if you’d like one, feel free to add it! 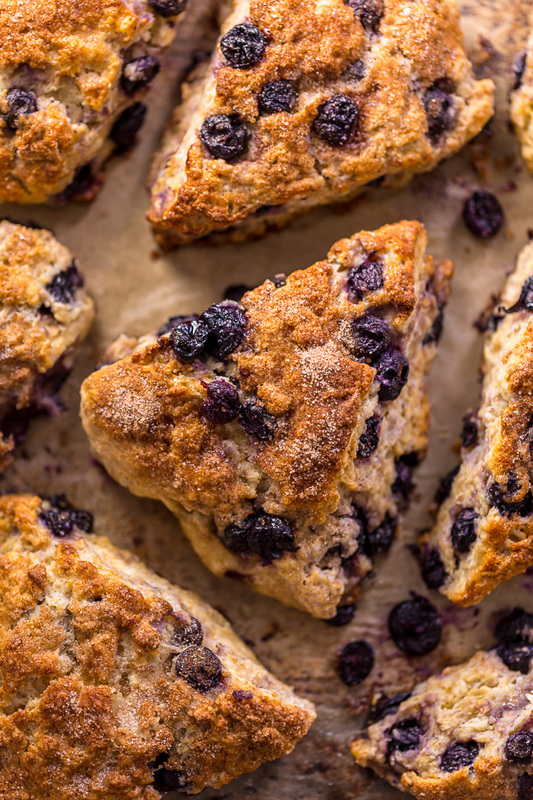 For best results, glaze the blueberry snickerdoodle scones right before eating/serving. Otherwise they’ll become soggy… and nobody wants a soggy scone! Finally, these scones are truly best eaten the day they are made. But will “keep” loosely covered in saran wrap and stored at room temperature, for 2 days. 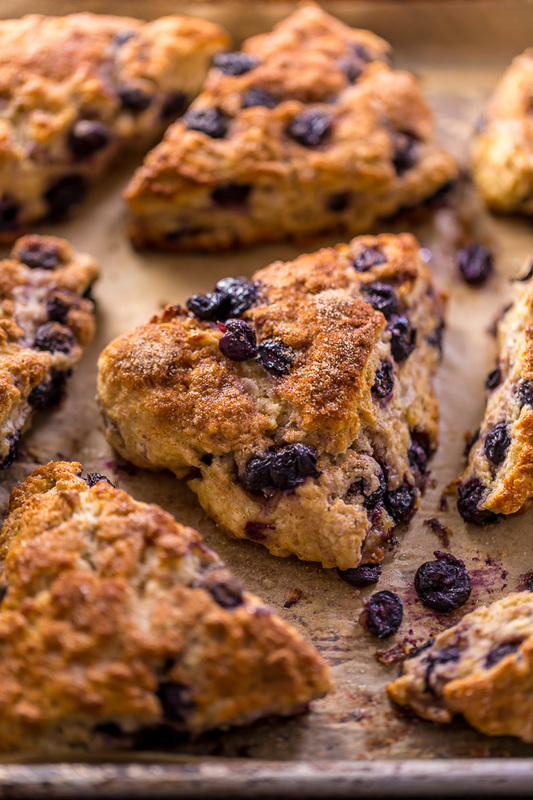 To reheat room temperature scones, preheat the oven to 350°F (177°C). 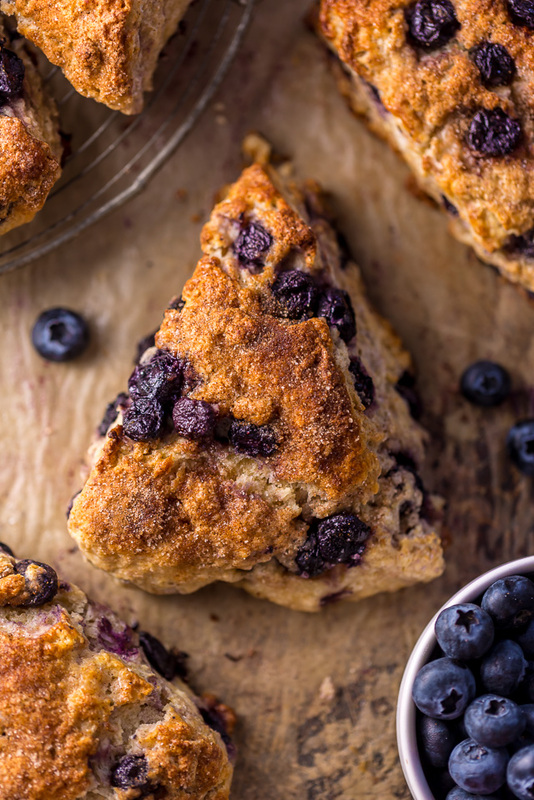 Place the scones on a baking sheet, tent lightly with foil, and warm in the preheated oven for 8 to 10 minutes. 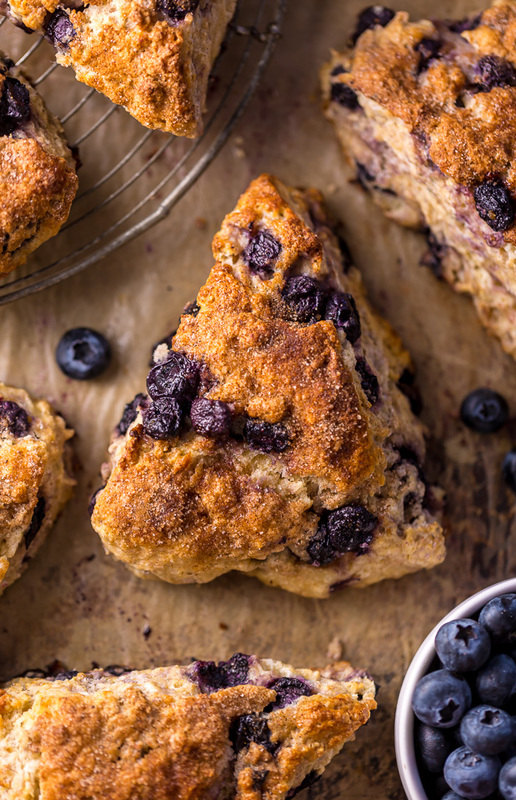 While these scrumptious scones are delicious on their own, they’re extra enjoyable when served with a cozy cup of coffee or tea! Let me know what you’ll serve them with in the comments below. And have a blessed day! 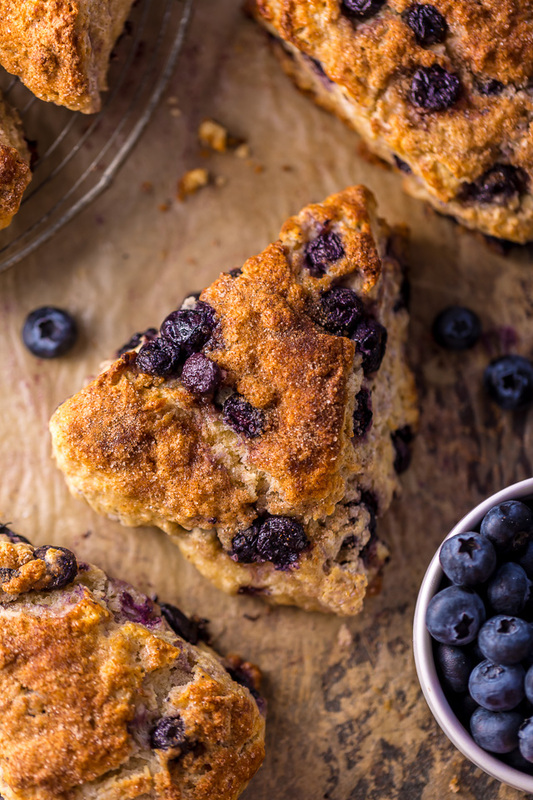 Warmly spiced and so delicious, these Blueberry Snickerdoodle Scones are perfect for breakfast or brunch! Preheat oven to 400°F (204°C). 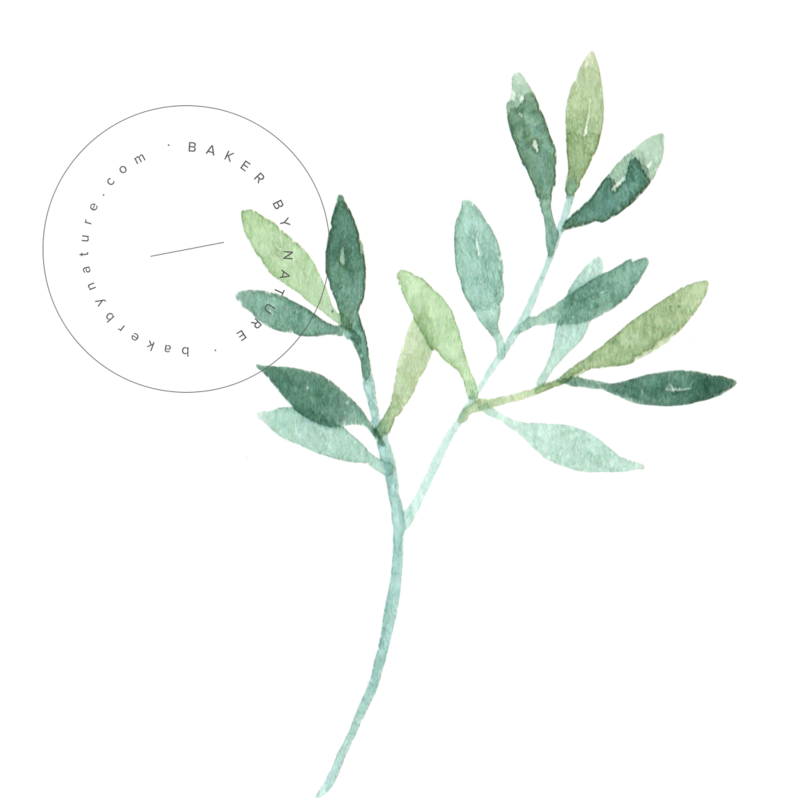 Line a large baking sheet with parchment paper and set it aside. In a large mixing bowl, whisk together the flour, brown sugar, baking powder, cream of tartar, nutmeg, cinnamon, and salt. Using a pastry cutter, cut in the butter until the mixture resembles a coarse meal. In a medium mixing bowl, whisk together the egg and buttermilk until well combined. Add the liquid ingredients to the dry ingredients and, using a rubber spatula, stir until the mixture is evenly moistened and holds together. Gently fold in the blueberries. The dough will still be slightly shaggy at this point. Transfer the dough to a lightly floured work surface gently knead it together a few times before shaping it into an 8-inch circle. Using a large knife, cut the dough into 8 even wedges and carefully transfer them to the prepared baking sheet. In a small mixing bowl, combine the sugar and cinnamon. Lightly brush the top of each scone with buttermilk, then sprinkle with the cinnamon sugar mixture. Be sure not to let the buttermilk drip on the parchment paper, or it will burn. Bake for 20 to 22 minutes, or until the tops are lightly golden brown. 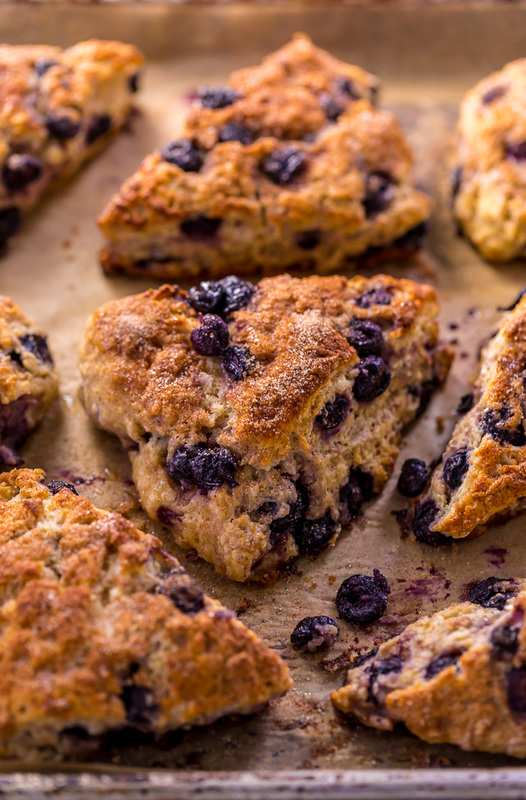 Allow scones to cool for 5 minutes on the baking sheet then serve warm. Do you have recipes that don’t require eggs or nuts ? Ashley, are you by any chance writing a cookbook? Can I make the dough the day before? Hi Lindsay! You can make it and freeze it 🙂 Just add a minute or two onto the baking time! 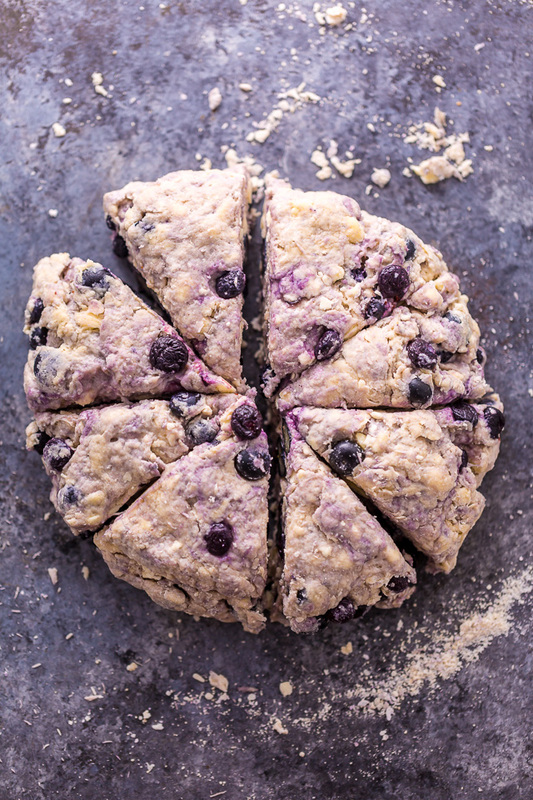 You’ve literally combined three of my favorite things in this recipe (scones, snickerdoodles and blueberries!!!) Cannot wait to try this recipe out!